Shopping for a new Hyundai Santa Fe? If budgets allow, the Santa Fe Ultimate offers a surprising amount of luxury features at a price less than $40,000. The 2019 Hyundai Santa Fe crossover SUV is a familiar name on a new body. The turntable of names for the South Korean automaker now applies to a two-row crossover that used to be called the Santa Fe Sport. A three-row Santa Fe is in the works, and a bigger Santa Fe XL is last year’s Santa Fe, carried over for another year before it’s entirely replaced. Under the hood, a 2.4-liter inline-4 is standard and a 2.0-liter turbo-4 is optional. The base engine’s 185 horsepower adequately motivates the 3,591-pound mass, but it’s not hurried. The 235-hp turbo-4 is brighter, but we think some slack in the new 8-speed transmission may be damping its pep a little. Front-wheel drive is standard in every Santa Fe, and all-wheel drive can be had on any trim level for $1,700 extra. An 8-speed automatic is new this year, but we’re more sold on the refined ride and quiet demeanor on the road. The Santa Fe features standard forward-collision warnings with automatic emergency braking, blind-spot monitors, adaptive cruise control, active lane control, and a rearview camera with rear cross-traffic alert on every trim level, which is admirable at just over $25,000 to start. Base features include Bluetooth connectivity, cloth upholstery, 17-inch wheels, and a 7.0-inch touchscreen with Apple CarPlay and Android Auto compatibility for infotainment. Top Ultimate trims offer 19-inch wheels, leather, an 8.0-inch touchscreen, premium audio, heated and cooled front seats, heated rear seats, surround-view camera system, heated steering wheel, wireless cellphone charger, head-up display, and automatic wipers. With all-wheel drive and an uprated turbo-4, the Ultimate 2.0T rings the bell at less than $40,000 with a 5-year/60,000 mile warranty. Hyundai’s value proposition is a name we recognize, too. The 2019 Hyundai Santa Fe wears sharp new sheet metal and a handsome interior that gets better in top trims. 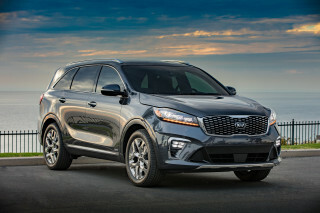 The pivot toward more SUV-like chops is evident in the rear, which now features a more upright and vertical tailgate than the Santa Fe Sport. The upright looks carry all the way into the roofline, which is squarer and affords rear riders more windows—Hyundai says the windows are 40 percent bigger this year. 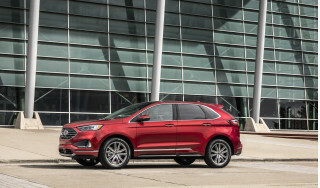 Rounded creases in the body sides hide a fairly large amount of sheet metal (the Santa Fe is nearly 3 inches longer this year) and the bigger nose is punctuated by a large grille and thin, swept-back headlights. The inside features a two-tier dash that’s broad and wide, but sculpted to contain driver and passenger sides independently. The headliner in top trims is soft and lightly colored. Our Ultimate tester had a light tan headliner with a soft linen feel that punches higher than we expected. The 2019 Santa Fe has a new 8-speed automatic transmission, but its smooth ride is more surprising. A new 8-speed automatic transmission complements two familiar engines in the 2019 Santa Fe. The base engine is a 2.4-liter inline-4 that makes 185 horsepower and an optional, 235-hp 2.0-liter turbo-4 is available. Both can be mated to front- or all-wheel drive in every trim level. Most of our turns in the Santa Fe have come behind the wheel of the uprated turbo-4, which has better power than the base 2.4-liter inline-4. Hyundai says the more powerful engine has more torque lower in the rev range than before, but slack in the new transmission may be sapping some of power immediately off the line. The power builds relatively low in the rev range, less than 1,500 rpm, but it momentarily hesitates off the line when pressed into action. The 2.0-liter turbo-4 is best at passing speeds, when it accelerates quickly to pass and the transmission seems more willing to kickdown a few gears to pull off a mountain pass. The 8-speed automatic fitted to both engines is new for this year and resolves our quibble last year that the Santa Fe was down on cogs, compared to its rivals. Engineers from Hyundai say that every inch of the transmission has been smoothed over for refined character: ball bearings instead of roller bearings for less friction, quicker torque converter lockup, and wider ratios in the 8-speed. It’s better than the 6-speed at keeping the Santa Fe efficient, but there may be some improvements yet to come. The biggest improvement in the Santa Fe’s character is its ride for this year. Front struts are paired with a rear multi-link setup in every trim level, while Limited and Ultimate get a self-leveling rear air suspension for calmer rides and more confident towing. The rear shocks have been pushed more upright this year for longer travel and better ride quality, paired with a body that’s stiffer by 14 stiffer. 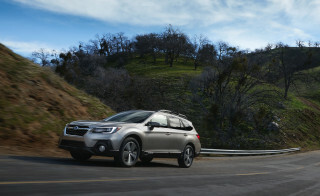 It hardly makes the tall crossover a canyon carver, but it is confident and calm on the road. Front-wheel drive is standard on every trim level and all-wheel drive is a $1,700 extra-cost add-on. Hyundai says the all-wheel drive system has been tuned to be more predictive than reactive; it considers gear, speed, steering angle, and other factors when engaging the rear wheels for better traction. In our testing, the Santa Fe calmly scrambled up loose dirt two-tracks without much of a fuss. It’s probably a better all-weather system then an all-terrain system, however. Our limited exposure with the base engine, which Hyundai says will be fitted in 3 out of 4 Santa Fes, revealed what we expected from an engine that makes 185 hp tasked with moving more than 3,500 pounds. The base 2.4-liter inline-4 is adequate, but not rushed. The 8-speed automatic tasked with efficiency felt at odds with an engine that needed more revs to deliver its power. One note: Our turns behind the wheel of the 2.4-liter were at more than 8,000 feet, when naturally aspirated engines are gasping for oxygen and down on power already. The 2019 Hyundai Santa Fe is a competitive, comfortable family hauler. The 2019 Hyundai Santa Fe drops “Sport” from its name but gains more room for passengers and gear this year. This year, the Santa Fe has grown between the wheels and between the bumpers. Hyundai has added 2.6 inches between the wheels and 2.8 inches from bumper to bumper, mostly for passengers. Rear seat riders get more than 40 inches of leg room, which is believable—our 6-foot-3 editor had no issues riding behind someone of equal size. The front seats are improved this year with better bolstering and more comfort. The only dimension that the Santa Fe didn’t grow was should room, which seems like it’d only be an issue for Olympic swimmers and starting middle linebackers. For the rest of us, the seats are comfortable and supportive, shod in cloth that feels a little too thin or leather that feels more durable, but not very soft. Later this year a three-row Santa Fe will make its debut, and squeeze those dimensions slightly, but that third row is probably better left for children only. Hyundai offers a two-speed power liftgate on some models that can open handsfree, which should help overburdened parents. With two rows of seats in place, the Santa Fe holds nearly 36 cubic feet of cargo—about average for its class—or more than 71 cubes with the second row folded down. There’s plenty of space between the wheel wells, and the rear hatch opening is wide and relatively low. For all passengers there are smart storage features such as cubbies and shelves, a boon for long trips. Under the two-tiered dash on the passenger side, there’s a cutout shelf for smartphone storage complete with grippy rubber mat to hold phones in place. In all trims, the Santa Fe has nice dash materials, including real stitching, and a high-quality feel to most of its trim pieces. There are a few places where cost-cutting is evident: hard plastics on the side of the center console and a thin pile to its cargo floor carpet. Top trims get an attractive headliner that’s lighter and almost denim-like—it’s stylish and contributes to a lighter cabin. Good crash-test data and automatic emergency braking nets the 2019 Santa Fe a good score here. 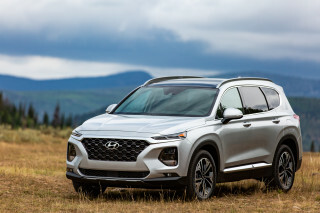 Federal and independent testers have good things to say about the 2019 Hyundai Santa Fe. This year, every Santa Fe is equipped with standard, life-saving active safety features that are more common among automakers. Each 2019 Hyundai Santa Fe is equipped with forward-collision warnings with automatic emergency braking, blind-spot monitors, adaptive cruise control, active lane control, and a rearview camera with rear cross-traffic alert. Optional extras for the Santa Fe include a rear passenger alert, a surround-view camera system, parking sensors, and LED headlights. Hyundai doesn’t offer options on any trim level, so looking for additional safety gear will require springing for a spendier trim. The Santa Fe comes standard with blind-spot monitors, a boon on an SUV this size, but it also has good outward vision, with a decent view from the three-quarter angle. The IIHS said that Santa Fes equipped with LED headlights earn its Top Safety Pick+ award. The standard halogen headlights don't provide as much coverage, the insurance industry-funded organization said. Those models don't earn the award. The 2019 Hyundai Santa Fe is a good value in most trims, no options outside of trims keeps it from scoring higher. Features help the 2019 Santa Fe stand out from competitors, including its impressive warranty. 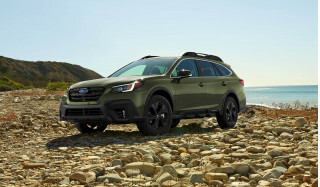 All versions of the new crossover are equipped with impressive gear for a crossover that starts at $26,480: power windows, Bluetooth connectivity, active safety tech (covered above), cloth upholstery, and a 7.0-inch touchscreen with Apple CarPlay and Android Auto compatibility for infotainment. 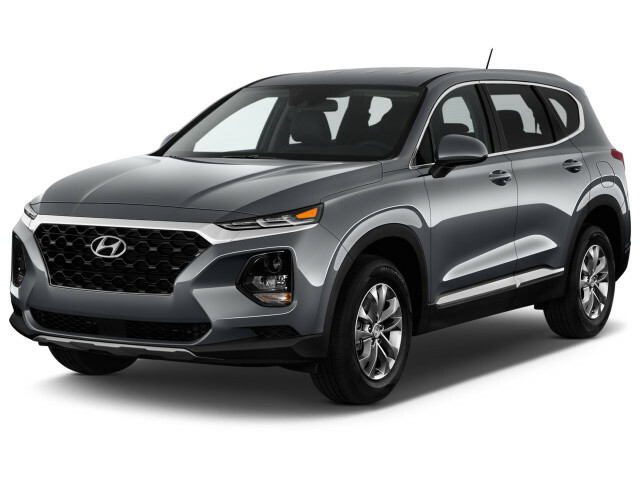 Hyundai offers the Santa Fe in SE, SEL, SEL Plus, Limited, and Ultimate trim levels that can push the price up to nearly $40,000 for fully stocked models. 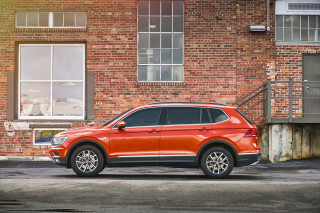 At every trim level, all-wheel drive is a $1,700 extra. Limited and Ultimate versions can have an uprated 2.0-liter turbo-4 for $1,600. Ultimate versions are impressively equipped. Leather upholstery, an uprated 8.0-inch touchscreen, premium audio, heated and cooled front seats, heated rear seats, surround-view camera system, heated steering wheel, wireless cellphone charger, head-up display, and automatic wipers. It’s enough for less that we’d almost say that it’s the value pick. Opting for the Limited trim level piles on luxury amenities without the inflated price. Those versions are equipped with leather upholstery, premium audio, keyless ignition, heated front seats, dual-zone climate control, and a 7.0-inch touchscreen for infotainment with Apple CarPlay and Android Auto compatibility. A front-drive Limited with the base engine costs $33,580; all-wheel drive and turbo-4 brings the total to $36,880. That’s a compelling value against others such as the Ford Edge Titanium that can cost more than $40,000, before incentives. Beyond price, Hyundai offers a generous comprehensive warranty that covers 5 years/60,000 miles that beats many competitors. Hyundai’s BlueLink infotainment is one of our top picks thanks to its ease of use and straightforward layout. Although embedded navigation is only offered on top Ultimate trims, all trims get smartphone compatibility with Apple Maps, Google Maps, or Waze navigation. A new 8-speed automatic helps the 2019 Santa Fe stay competitive for fuel economy. The 2019 Hyundai Santa Fe is reasonably fuel efficient among mid-size crossovers. The most efficient Santa Fe is equipped with front-wheel drive and the 2.4-liter inline-4 base engine. The EPA rates those versions at 22 mpg city, 29 highway, 25 combined, and others aren’t far behind. The uprated 2.0-liter turbo-4 and front-wheel drive rates 20/25/22 mpg. Adding all-wheel drive to any Santa Fe cuts fuel economy by 1 or 2 mpg across the board. Compared to its rivals, the Santa Fe fares well. 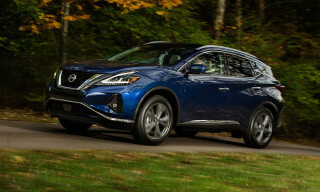 The Ford Edge rates similarly with its turbo-4 and all-wheel drive, and the Nissan Murano manages roughly 24 mpg with a V-6. A diesel-powered Santa Fe is on the way, which should be even more efficient, although Hyundai hasn’t yet detailed those versions. Looking for a different year of the Hyundai Santa Fe?